It has become common for the llama community to mislabel any shorter wooled llama as "classic" or a pack llama. Many do not truly understand what a classic packing llama is and still fewer understand that just because it has a classic coat, doesn't mean it is a good packer. It has now become a buzz word for some breeders trying to sell their llamas that truly aren't suited for work on the trail or in the showring. Many light wools are NOT classics - they don't shed out and have to be shorn instead. Many outwardly classic-looking llamas are NOT from classic bloodlines........they are accidents (mutts) from mostly woolly ancestry and will NOT breed true. To make matters worse, there are groups of people trying to label quality llama packers through their own personal criteria without truly testing the abilities of these llamas on the trail. PROOF is only done through being on the trail, everything else is just talk and marketing! Now many woolly llama breeders are buying these animals and trying to make make big money breeding them. Sadly, in the end the llamas will pay and the owners will find out that many lack the conformation to be long term sound packers. Just know that many llama owners say they have packers for sale or that their llamas pack. They themselves do not pack and their llamas are not suitable for packing. Good packers are built/bred specifically for it and have athleticism. Just because someone put a pack on a llama while training around the farm, doesn't make it a packer. That is as foolish as many of us putting on running shoes and saying we could run a marathon! Quality pack llamas sell for $3,000 and up usually if they are the real deal, you will not find them on Craig's List. You get what you pay for usually when it comes to pack stock. Llama body frames are not made to carry excess weight. Most llamas should weigh roughly 275-350lbs depending on their height. Their height should be about 43-46 inches at the withers. Breeding for larger framed, boned and sized pack llamas causes many issues with the llamas natural gaits, movement and structure. 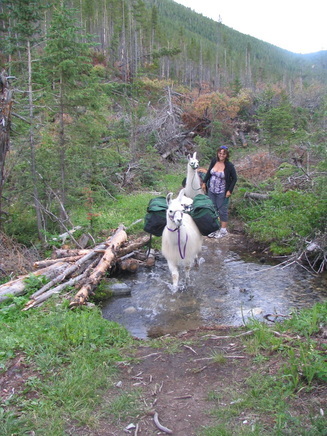 Most pack llamas should not be packing 25% of their body weight or even 100+ lbs. The long term effects of this type of approach can be seen in the demise of many pack llamas pasterns, hocks, knees and more as young animals. This is devastating in an animal you wait to pack with until they are age four and then spend several years training. In 2004 we began the first acquisition of our now blossoming classic pack llama keeper herd. True classics are rare and hard to find. Most either do not have classic pedigrees or lack the conformation needed to survive longer than a couple of pack seasons. We have tried to seek out animals for our llama packer program with longevity, strong conformation and thinner athletic builds. It has taken us years and searching through thousands of classic pack llamas, to find the animals that we currently have. We are still searching for more to add, and have had little to no luck. Many llama packers we see are ﻿post-legged, down in the fetlocks (aka pasterns), have hip issues, are over in the knees﻿ or just not well put together. To make matters worse, there is a huge emphasis on looking for BIG llamas for packing. There is no factual or rational information that supports that bigger is better for trail work. It is is a highly overrated marketing ploy used by a few breeders that don't actually understand what happens when you breed to extremes in livestock. Like everything (horses, dogs, sheep, pigs, chickens etc. ), we have to "Super Size" our llamas too. As we have studied and gone over thousands of pedigrees and historical information, we now know that the optimum height for long-term soundness is 43-46 inches at the withers. Unfortunately too, some breeders do not know how to accurately measure a llamas height and tend to exaggerate the actual height of the llama. While the emphasis is said to be on "Saving the true pack llama," instead we are ruining them as much as the woolly breeders did in the 80's. Our senior classic pack llama male Anders Tobias is an outstanding pack llama on the trail, even with no conditioning prior to trips. While we wouldn't recommend this for the average llama, it does demonstrate his superior conformation and athletic attributes. Toby also packed 90+lbs easily (prior to being injured in 2010) and was born in 1994, so he isn't young by most breeders standards. In addition he started his show career at the age of twelve and is an ALSA Halter Champion and PLTA certified Master Packer. To our knowledge, he is the ONLY male in the show system who is classic and holds both of these titles. Toby's whole pedigree is of classic lineage. We were fortunate to obtain Toby when his owner decided to quit breeding and retired. Toby hails from the Rocky Mountain Handsome Line, known for it's packing abilities and stamina. He is an exceptional packer who has many offspring packing for people and a very long waiting list for his future offspring. Talk to anybody that has been out with him and they will tell you his work ethic is like no other llama they have seen! Toby has had 100% classic coated offspring with over 30 offspring on the ground. No other pack llama male to our knowledge has been able to claim this strong of a track record. At age 23 he is still fertile and active. Prior to buying ﻿﻿﻿CTL Sulu﻿﻿﻿, we had bred one of our best classic girls to MPL Sky Rocket. About a month after breeding Sunshine to Rocky, he died. This pairing produced a nice classic male named "JNK Cayetano﻿"﻿ in April of 2011. Cayetano's dam "Sunshine" was by Rocky Mountain Jester. One of the very first all around packing, driving, performance and super llamas. Sunshine produced exceptional offspring into her late teens for us. Cayetano is an outcross male with such llama packing greats as Rocky Mountain Jester, Bett's Supaya and MPL Sky Rocket. He is an outcross to most of the packing lines currently being bred. Cayetano went out on his first pack trial in 2013 and passed his basic level with no hesitation (thank you Carolyn). Additionally, Cayetano ended 2013 undefeated in halter and with 8 Grand Champions. Beating several of the "Super Sized" llamas in his classes. 2014 was taken off and in three shows in 2015 he earned six more Grands in Halter classes and a growing number of fans. 2016 ended his halter competition with 20 total Halter Grands to date and undefeated in the showring. In 2017, he started the season by winning double Grand Champions in Halter and then finishing the show with double Best of Show Male. While we know showing isn't the be all end all, it does give an outside opinion of his great quality. Cayetano passed all his evaluations and testing to be registered "Complex" with Pet Partners (aka Delta Society) and has been a registered therapy llama since 2014. He has a mellow and sweet attitude on top of being a well put together guy! We are very pleased with his babies so far. They are beautiful, correct and have his laid back disposition. We were fortunate to obtain a Rocky Mountain Jester daughter in our herd. Rocky Mountain Sunshine was born in 1996 and entered the showring for the first time in the Fall of 2008 (at age 12). There at the very first classic division, she took a Reserve Grand Classic female behind her sister Rocky Mountain Inca's Legacy Lady. Sunshine regularly cleaned up in halter here in the NW. This female had an awesome coat and great structure. Sunshine was the 2009 NW Region High Point Classic Female. Her 2010 daughter "Caldera" (by Toby) was the 2011 ILR-SD International Gathering of Friends Reserve Grand Classic Female. Caldera also ended the 2011 show season #1+2 in all the ILR-SD Top 10 lists for performance. In addition, Dara is Niki's driving and packing buddy. Sunshine's son "JNK Cayetano" is part of our breeding program and has far exceeded our expectations for a home bred male. We have also retained Sunshine's 2014 son "JNK Tobias's Trask" as a potential replacement for his father down the road. WE LOVED THIS FEMALE AND HER OFFSPRING! Unfortunately, we lost Sunshine to Cancer in December 2015. Just prior to finding out she had Cancer we were considering showing her again at age 18. Her legacy lives on in our breeding herd. Rocky Mountain Inca's Legacy Lady is the girl that we called "eye candy" around here. Legacy was cherry picked out of Bobra Goldsmith's longtime classic llama packing breeding program in 2007 and she did not disappoint us ever. Co-owned with Niki's 94 year old Grandmother, Legacy won the NW regionals in 2007+2008 and in one year racked up 10 Grands in halter and the 2008 National Reserve Grand Champion Light Wool Female. Legacy also won the very first ALSA Classic Female division offered in the Fall of 2008. When we retired her to have babies, she left with over 15 grand champions in the showring. Legacy and Sunshine's dam, Bett's Supaya (born in 1986), had produced numerous classic packers and lived to be 24 years old. Supaya was still completely sound and her fetlocks were strong at the time of her passing. Legacy descends from the Rocky Mountain Spook and Inca lines, which are both known for their work ethic and packing abilities. Legacy has numerous offspring packing for their owners around the country. She is also the mother of the famous "Arizona Runaway Llama." Sadly, we had to euthanize Legacy on 10/2/17 due to an unfortunate injury. Legacy's 2016 daughter JNK Tobias's Toviah (by Anders Tobias) was retained for our breeding herd. We have retained one of Sunshine's, one of Legacy's and one of Rosie's daughters (all by Anders Tobias) in our classic program, ﻿JNK Tobias's Caldera, JNK Tobias's Kalosi and JNK Tobias's Toviah. They have entered our llama packer/therapy/driving program and two are being used for breeding to carry on their dam's production in our herd. All are Toby daughters and fine examples of the great temperament and work ethic he stamps on his babies. We have realized after seeing much of what is out in the packing community for sale, we need to keep more of our own stock to breed. 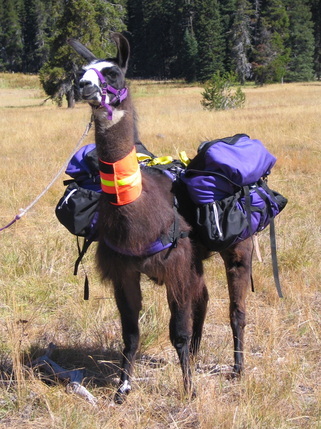 Caldera is a registered "Complex" therapy llama with Pet Partners. Dara and Kalosi are now producing packer offspring in our herd. When Toviah is older, she will enter our breeding program as well. If you do want to learn more about the criteria that is used in the selection of whether a llama is classic or not, I would highly recommend you go to the International Lama Registry (see classic llama focus group work) to see a clear definition. 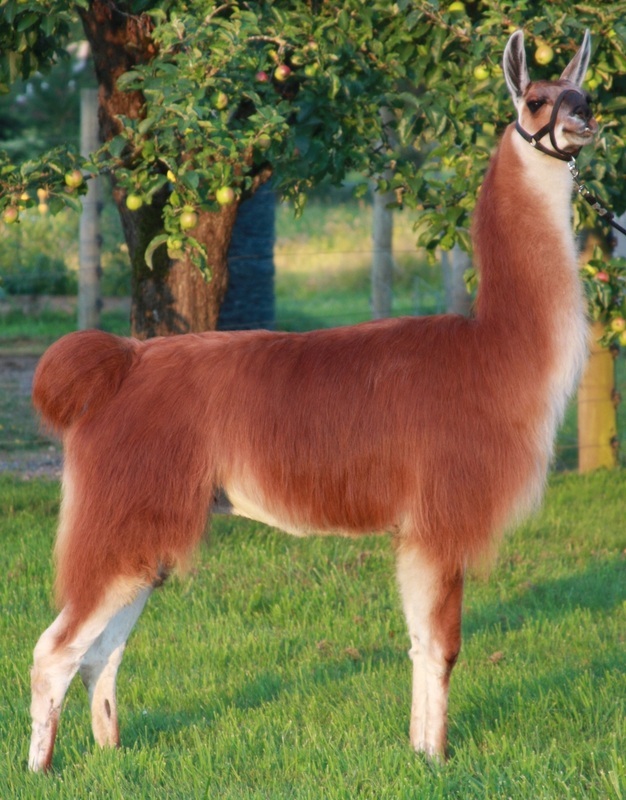 If you are considering buying a classic-looking llama for breeding, or wondering whether you should breed your classic-appearing llama, research the animal's full ancestry in the International Lama Registry database to be sure the llama was intentionally produced from classic bloodlines and can be expected to produce classic llamas. Classic pack llamas that have been screened as classics are listed within the database under their profile. 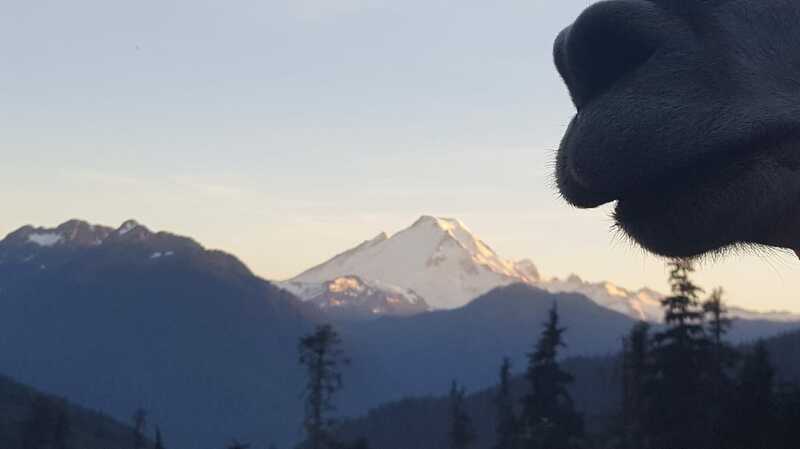 If you are considering buying a classic llama (or any llama) for packing, we suggest testing the animal through PLTA trials or similar repeated on-trail testing, or else purchasing a PLTA certified packer that is already proven to meet the criteria for the type of hiking you will do. Our bottom line goal is to produce classic pack llamas that are built to last for many years on the trail and have a history of packing! If you want a cutting horse, you buy one from proven cutting lines. The same is true for pack llamas. We have chosen to produce quality instead of quantity. If you would like to be put on our growing waiting list for quality bred classics, please CONTACT us. References are available upon request from previous customers. Beware of hype and promises from people who do not really pack with llamas! "Should" or "Would" make a good packer statements from breeders who do not pack are foolish promises.